SOUTHERN Queensland grower Ted Shooter is one of the first in the world to trial ground-breaking new grain sorghum herbicide tolerance technology ‘igrowth’. Mr Shooter tested the new Pacific Seeds imidazolinone-tolerant grain sorghum line featuring its proprietary igrowth trait on his Victoria Hill farm prior to its debut at a series of field days across the summer cropping region in February. The first igrowth hybrid, Sentinel IG, featured in his program and will be commercially available this season. Mr Shooter farms 670 hectares across six blocks under the Bellevue banner with his parents Ray and Olive, wife Kerri and children Kate, Harry and Bridie. 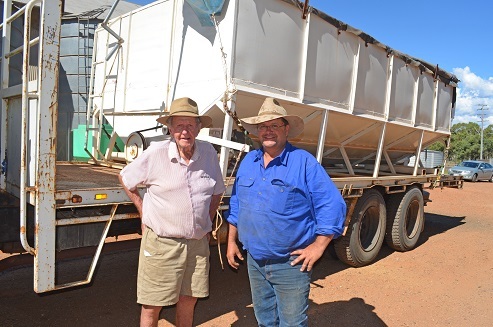 He planted 7ha of Sentinel IG alongside his 103ha commercial crop of MR-Buster. “The total 110ha of sorghum yielded about five tonnes/ha at harvest in early March, with the new hybrid slightly out yielding MR-Buster,” he said. “Harvest was extremely busy for us, so we didn’t get a chance to conduct a rigorous yield data test, but we did get an idea of what it is capable of. The crop was planted in the first week of November and received good rainfall throughout the growing season, with 75 millimetres in October, 72mm in November, 92mm in December, 39mm in January and 8mm in February. Mr Shooter, who grows sorghum and mungbeans in summer and wheat, barley and chickpeas in winter, said some of the biggest developments in cropping for them had been no till and spraying out sorghum. “The moisture conservation that no till offers is priceless and the ability to spray out sorghum with Roundup was huge for us,” he said. “Sorghum used to be a season-long hungry crop but killing the plant prevents it from using valuable nutrients and soil moisture. Mr Shooter said igrowth technology was going to be a boon for his flat country since floods created big issues, particularly the spread of Johnson grass. “Sentinel will give us the opportunity to use group B herbicides in-crop to assist in our integrated weed control on the family farm,” he said.